Welcome to Underappreciated, a showcase for outlier vehicles from the late 20th and early 21st centuries, cars that presented fresh ideas or innovative technologies but failed to connect with consumers then and remain undervalued (read: bargains) today. Infiniti was a bit troubled at the end of the 1990s. Unlike its competitors from Toyota (Lexus) and Honda (Acura), after its first decade in the U.S. market Nissan’s upscale brand had failed to crack the magic 100,000 annual sales mark. In an effort to boost its fortunes and image, the brand added the midsize M45 (internal code Y34) sedan in 2003. The M was intended to patch a medium-size hole in the Infiniti sedan lineup, slotting between the smaller G and the larger Q. 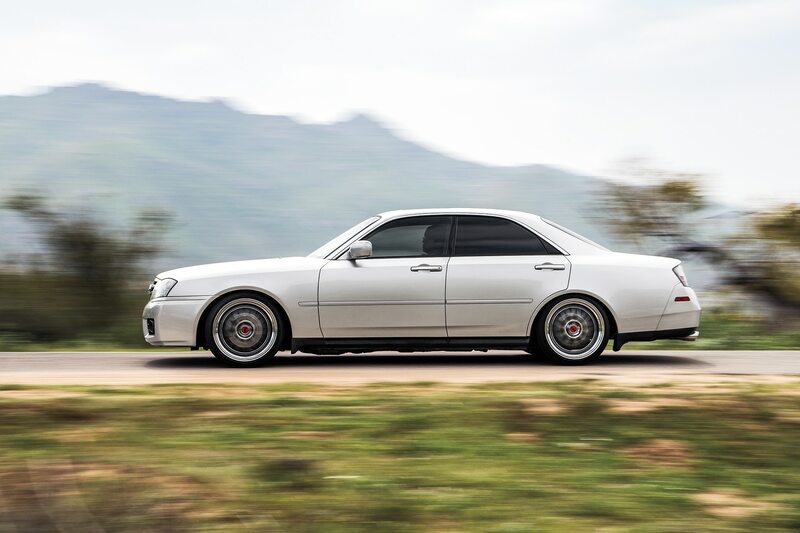 Like similar vehicles from its German and Japanese brethren—E-Class, 5 Series, GS—it was a step up from entry level and a step down from top tier. But its core play was its performance-to-price ratio. With a base price of just $42,300 and a naturally aspirated 4.5-liter V-8 from the Q-ship providing 340 horsepower and 333 lb-ft of torque, it was close in output to high-test executive sedans from the likes of Mercedes-Benz’s AMG or Jaguar’s R subbrands but at a cost closer to their basic six-cylinder models. Featuring a bit less mass than its big brother, the M45 was able to hustle to 60 mph in about 5.7 seconds, which was quite an achievement for the time. Perhaps more important than this was the way the M45 looked. The sedan had a beveled front and rear, muscularly rounded flanks, and a pert if lengthily overhanging tail that conspired to give it a kind of sneering American menace. It looked like a modern interpretation of something Elwood Engel (Chrysler’s design chief during the mid-’60s) might have penned, along the lines of a scaled down Imperial Crown sedan: angular, squatting, wide-eyed, and ready to roar. 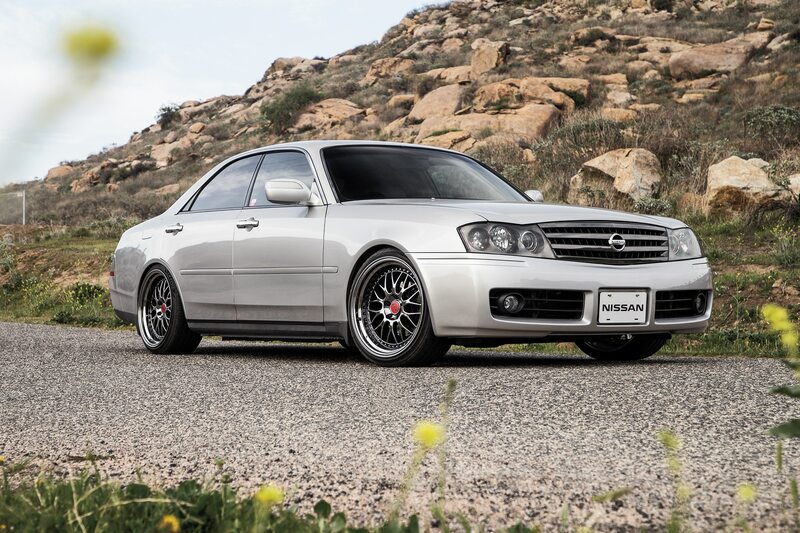 Joe Wu has changed the car’s bumper and grille, rebadging it as a Nissan, and added chrome-ringed snowflake wheels to give it a tuner JDM feel. He’s also worked on the interior, locating hard-to-find trim bits and veneer. Alas, this contentious design was in many ways the car’s Achilles’ heel, as it didn’t resemble anything else in the Infiniti lineup. This wasn’t exactly out of the ordinary. For much of the brand’s first decade, its styling was somewhat grab-baggy in its diffusion—a blocky convertible next to a sleek executive sedan next to an inflated truck-based SUV next to a spruced-up front-drive commuter. This was the result of Nissan’s proclivity for poaching an existing if sometimes outmoded Japanese Domestic Market (JDM) vehicle, stuffing in a bigger engine, and slapping on a gaudy Infiniti badge. 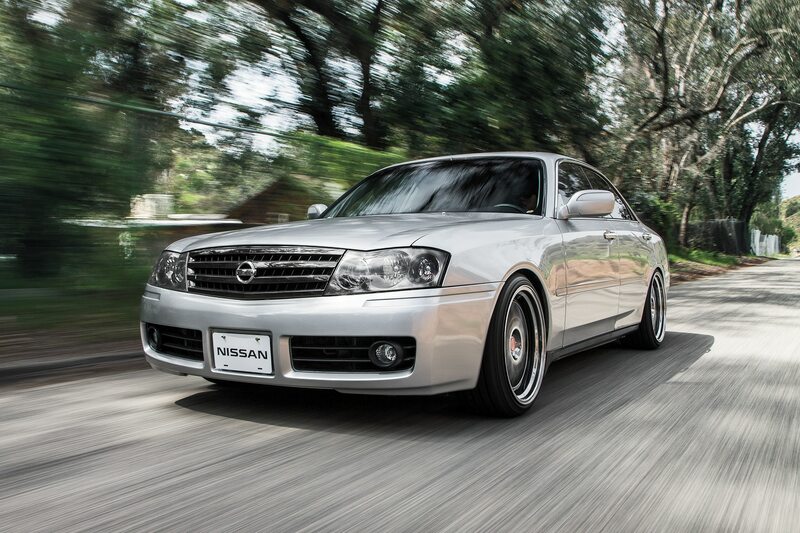 This was certainly the origin story for the M, which began its life as a V-6-powered Nissan Gloria. Sadly, the M’s retro-inspired styling, while au courant in the industry at the time, with VW’s New Beetle and Ford’s Thunderbird redux, didn’t sit well with customers who were in the market for a contemporary Japanese near-luxury offering. What those customers apparently wanted was a high-riding, cramped, all-wheel-drive hatchback shaped like a creasy high-top sneaker. 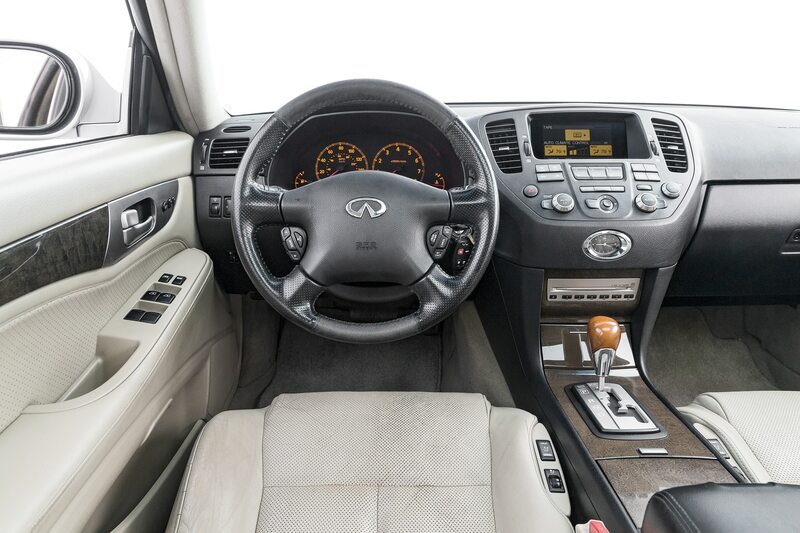 Something like the trendsetting Infiniti FX sporty crossover, introduced about the same time. Although annual sales of the Y34 generation of M45 peaked at just more than 4,500 units in 2003, the FX immediately sold at an annual rate of around 30,000. This new sedan (internal code Y50) featured smaller exterior dimensions, more interior space, and a more conventional and amorphous design. Consumers responded by buying 24,000 of them in the first year. All of this conspires to make the Y34 not only relatively uncommon but also a car that many people are entirely unaware of. This will work in your favor if you want to buy one. Joe Wu’s upgrades to his Infiniti include BC coil-overs with adjustable dampers. 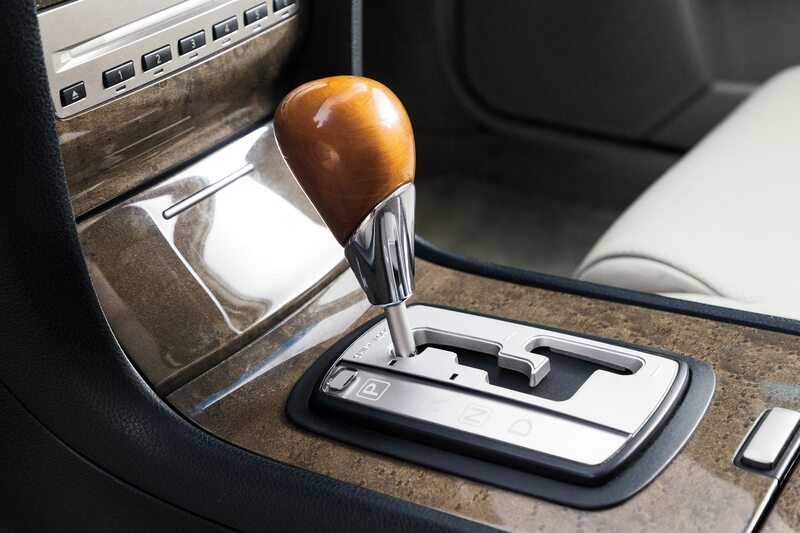 These cars were pretty loaded when new, featuring lots of leather and wood, sophisticated tech such as xenon headlamps, speed-sensitive steering, laser-distance cruise control, heated and cooled front seats, and a signature garish Infiniti analog clock. 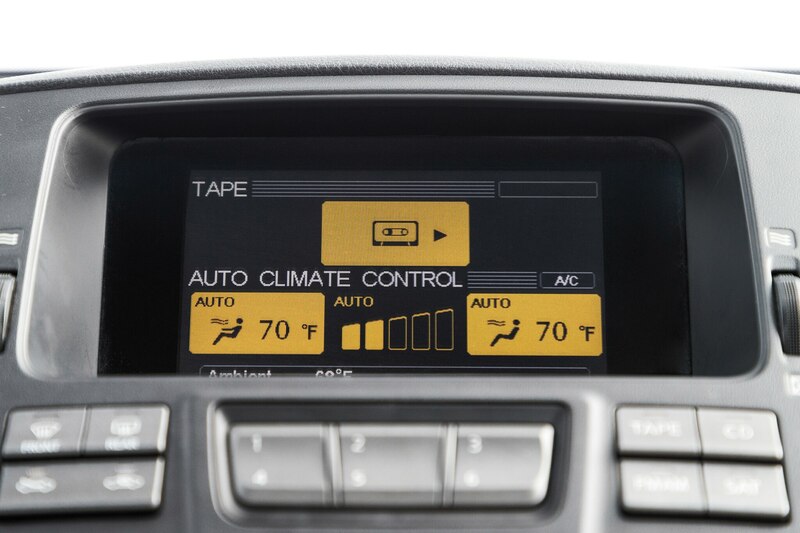 Still, searching online automotive listings revealed a number of well-cared-for cars with less than 100,000 miles trading in the mid-four-figure range. This low price will net you a thrilling and exclusive competitor to Aughties Germans. Plus, it will provide a point of access to those cool vintage Japanese car shows. “It has a definitive ‘JDM’ look that captures the eyes of tuners that grew up with Japanese hot hatches and who chose domestic-market-only cars to ‘drive’ in ‘Gran Turismo,’” Bazemore says. 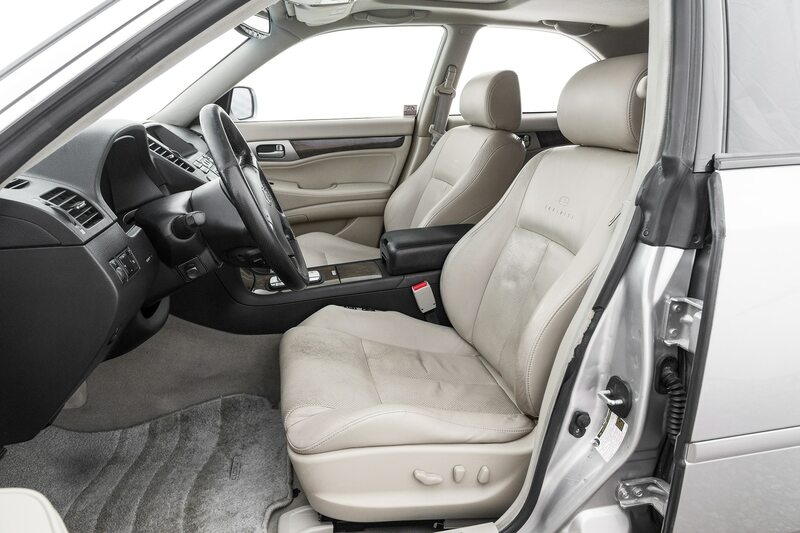 Older Ford Freestar, Mercury Monterey, Chevrolet Express, and GMC Savana vans are being investigated by the National Highway Traffic Safety Administration for corrosion problems, while the Infiniti M45 is being investigated for faulty fuel level readings.